If even. Re: Lorca, poor lad. Csaba Horvath’s muscular production of this play about passion and lust being stronger than resigned practicality is admirable in many ways. The problem is few of them illuminate what Lorca wrote. Style can only so far. Plays have stories and substance. A play like “Blood Wedding” works best when the overwhelming intense feelings of its characters are enacted directly, desire needing to consume all the oxygen when the two uncontrollable lovers see each other, make their moves, do their dodges, then bolt from respectability because, for them, there’s no other course. It may be all well and good to have these emotions played out in private paroxysms in which the Wilma audience sees the physical turmoil, nay torture, the characters experience. But “Blood Wedding,” and magnetic unstoppable romance, need two poles to show the irresistible attraction. When more emotion is expressed, via dance, usually on an upstage catwalk, the crux of Lorca’s situation, and much of our pleasure in seeing it take form, is lost. Horvath just about scuttled the god-damned ship! He’s made Lorca’s story, and the potential vigor of it, a flaccid exercise in show and style that smacks of self-indulgence, a subject anyone who knows or reads me has to be aware is my modus vivendi. The movements and poses Horvath creates are bold and tension-filled. Percussion accompanies every step a character makes whether in an all-cast folk dance or displaying individual angst. Even when Horvath’s dances — and he’s primarily a choreographer — are fierce, they’re inconsequential because they are a vestige in themselves and never move Lorca’s play along or comment intelligently on “Blood Wedding’s” story or its characters. This is bombast for bombast’s sake. It belies the more genuine, more visceral contexts and conflicts Lorca devises. It ignores the play to stage another kind of show altogether. That substitute show has its merits. Turning to the “admirable,” there is the disciplined synchronicity of the dances and assurance of most of the dancers. Justin Jain and Matteo Scammell, in particular, create wonders from their pas de deux. All hail their gymnastic prowess and the dynamism Jain and Scammell put into it. They don’t revive Lorca, but they give the eye plenty to take and savor on a different but entertaining artistic plane. Kudos to Ross Beschler who lulls you into thinking Horvath remembers Lorca as he beautifully and hauntingly delivers The Moon’s verse. Brett Robinson has the same effect as she croons the beggar’s lament. 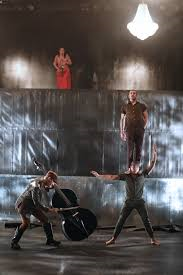 Among ironies in Horvath’s production is the music, by Csaba Ökrös, is more spellbinding than Horvath’s dances. Both the director and the composer deserve praise for turning more dialogue than Lorca set for song into lovely and listenable melody that has the ability, missing in most of the show, to intensify “Blood Wedding” and add to it depth. Lorca writes lyrically, a trait caught well by translator Nahuel Telleria, perhaps the main star of the evening. Putting the lovely language to music is the single sign of inspiration over exhibition. Too often, such language gets lost in climbing, gyrating, and clomping in a way that suggest an Andalusian oom-pah-pah. The people who suffer most for this are the cast enlisted to convey Lorca’s work. Of the major characters, only Jaylene Clark Owens gets a full chance to express a mother’s insights and emotions in clear, concise manner that provides a sense of Lorca’s intention and sets one key element of “Blood Wedding” in motion. Of the four principal characters, Sarah Gliko’s Wife alone breaks free to match all that happens to her, and her reaction to it, with Horvath’s hoofing. Jered McLenigan, dressed in red and looking like a dandy of the pampas, comes across from his first scenes as too weak in passion and character to stand up against Leonardo, his rival for the affection and consummation of the woman he is contracted to marry, called The Bride. He seems like a suburban mama’s boy who has business ambitions but no romance and worse, no libido. McLenigan even has a wheedle and whine in his voice. This is one of our region’s best actors, and Horvath’s production stymies him. Lindsay Smiling, as Leonardo, has the physique of a grand man of the plains and musters intensity, but he conveys no visible atraction, let alone a fatal one to The Bride. Scenes with Smiling, Gliko, and Taysha Marie Canales as Gliko’s mother barely register when they should set the tone for the lives and households Leonardo will be ruining if he cannot quell his craving and sense of possession for The Bride. Campbell O’Hare as The Bride shows little of the fire and sexiness that make two men desire her so ardently. Nor does she show the danger of defiance that cues an audience to beware of what this woman might do when confronted with the one circumstance that could convert her from acquiescence to passionate surrender, an encounter with Leonardo, which Lorca, of course, deftly engineers. Just because Horvath is immune to drama doesn’t mean Lorca is. Isn’t that the pity of it all? O’Hare breaks out of the surface mode in which Horvath entraps her in some telling scenes in which The Bride lets you know, in direct dialogue, what she’s thinking, but in scenes in which she has to respond to Leonardo, her groom, or both at once, you don’t see the internal conflict the bride is experiencing. A negotiation scene involving Clark Owens, Ed Swidey, McLenigan, and O’Hare played about the best of any because it was direct and unencumbered by Horvathisms. Oh yes, O’Hare’s Bride gets a dance on the catwalk, and she does it well, but it’s the McGuffin and not the McCoy. Horvath’s production goes awry from the first second. Instead of beginning “Blood Wedding,” or relying on Ökrös’s music to set a mood, he presents this elaborate folk dance in which all the characters, though as yet undefined, express their unanimous dudgeon in percussive steps that include a plethora of knee slapping, chanting, and groaning. In a dance recital, this would seem a powerful introduction to a company. In Horvath’s “Blood Wedding,” it made me giggle. Only twice audibly, and then muted so only people in adjacent seats might notice. The dance was risible because it was so gratuitous, so much flash for flash’s sake. Knowing the play, I knew it had nothing to do with the play. It didn’t set a tone or a scene. It do not suggest Spain, its Southern region where “Blood Wedding” takes place, or the drama that was to come. Some of Horvath’s dances within the piece had more relationship to a moment or action. This opener was bravura but had no target. Or worse, no aim. Unless it’s to dazzle or bamboozle. Yes, I found it not only gratuitous but fake. Benefit of the doubt remained in play. My attitude, despite my stifled chortles, was to see how “Blood Wedding” played out once Horvath deigned it should proceed. And the disappointment continued, giving way to ultimate disdain. The acting was as stylized as the opening dance. Emotion was absent, and McLenigan already made me think his Groom was unworthy of any Bride, no matter how O’Hare may portray her. He certainly wasn’t worthy of The Bride conceived by Lorca. A curiously upstage scene with Smiling, Gliko, and Canales had more dash but did nothing to allay my realized fear Lorca has been abandoned. My only hope was to wait with anticipation for the next chance for Jain or Scammell to toss, quite strikingly mind you, a table or twirl, hand-in-hand, in mid-air, defying gravity. Performers worked hard, admirably hard. Beside the complex dance steps, several cast members learned or entertained on various instruments, the bass and saxophone being the most prevalent and accentuating. Their virtuosic feats were appreciated by the Wilma audience, which you could tell when the tepid applause for the production swelled to a fittingly warm ovation once the lights came up on the ensemble. Thom Weaver’s lighting provided an evocativeness absent in most of Horvath’s production. 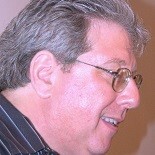 Larry D. Fowler also contributed importantly with his sound design. This entry was posted on November 18, 2017 by nzoren in Theater Reviews and tagged Blood Wedding, Brett Robinson, Campbell O'Hare, Csaba Horvath, Csaba Okros, Ed Swidey, Federico Garcia Lorca, Jaylene Clark Owens, Jered McLenigan, Justin Jain, Larry D. Fowler, Lindsay Smiling, Matteo Scammell, Philadelphia Theater, Ross Beschler, Sarah Gliko, Taysha Marie Canales, Thom Weaver, Wilma Theater.